An ingrown toenail is a medical condition where the outside edge(s) of the toenail becomes embedded into the soft tissue of the toe, causing irritation, pain, hypergranulation tissue or infection. There are several causes for ingrown toenails. Ingrown toenails are relatively common, and can affect people of any age, however they tend to have a higher incidence in active teenagers, and also the elderly. This is often present from birth (congenital) and means that one or more nails have become involutedor convoluted. 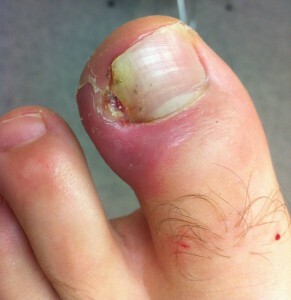 The nail then tends to wrap into the edges of the toe and cause chronic problems. Any injury to the toe that damages the nail and the growth area of the nail (the matrix), can cause the nail to begin to grow in an unusual manner that can lead to the nail to be deformed, thickened or grow in an irregular direction. Once the nail has been damaged in this manner, it is unlikely to ever go back to its normal appearance. When the nail is cut too aggressively into the corners or down the side, it is possible to either leave an irregular edge to the toenail, or even have a small piece of nail come away and become stuck into the side of the toe causing a foreign body reaction (or granuloma). Leaving the nail slightly longer, cutting along the natural curve of the nail, and not cutting down the side of the toenail can prevent this occurring. The culmination of years of wearing enclosed footwear, and repeated small knocks and bumps to toes and toenails can cause the toenail to gradually become deformed and have irregular growth. If you suffer from hammertoes, bunions, very high arched feet and many other conditions, the position of the toe (and toenail) can be altered from its most ideal alignment. This may cause the toenail to be frequently in direct contact with the ground, or in an unusual position which puts pressure of the soft tissues and the nail bed. Over time this can also cause the nail to become deformed or altered.